I am 29 years old, I shouldn't be suffering from spots! This is an outrage! I'm putting it down to hormones, stress and chocolate but ultimately I know that my chin has gotten wind that I have a big event to go to on Saturday and has decided to try to ruin my pretty outfit in the only way it knows how. I figured since it's the current bane of my life, I would share what my method for how to get rid of them. Now in fairness, everyone's skin is different and I wouldn't say that I have serious acne or anything, just the occasion, inappropriately timed spot. My first step is to make sure my skin is as clean as possible, if I'm going to touch it to apply anything I will also make sure that my fingers are squeaky clean. Where possible I try not to touch them and I will pat concealer over them when I do my make up. When I'm at home I will remove my make up as soon as I arrive back, your skin hasn't got lungs so I won't say it will help it 'breathe' but I equally think it's good for healing if it's not covered with anything. 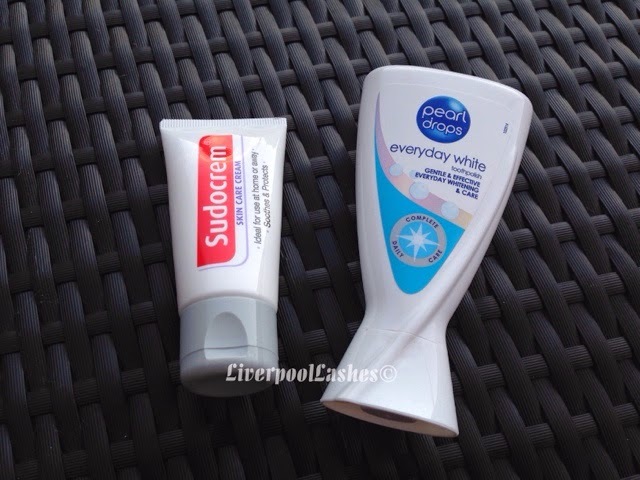 If I'm home then this is where my two products kick in, a toothpaste (any brand, in this case it's my current favourite Pearl Drops Everyday White toothpaste) and Sudocrem. If I'm in for the day I will apply toothpaste to a clean face in the areas required. The chalky texture will help to dry up the spot and it will dry onto the skin over the next few hours. I probably leave it on my skin for 4 or five hours and then I wash it off and apply my Sudocrem which will help with the healing process. I will also sleep in one of the two products, if I feel like it needs to dry out then I will apply toothpaste or if I'm at the healing stage then Sudocrem. I do find that my method does seem to help and it's definitely better than doing nothing! Wish me luck for a recovery in time for Saturday...!